The mechanical work formulation requires a weighing factor to use for the length of a path in order to disambiguate optimal paths. This weighing factor should be small. The default value for this weight is 0.00001. Set the factor to use for weighing path length in the mechanical work objective formulation. The weighing factor for the path length in the mechanical work objective formulation. Optimization objective that computes mechanical work between two states by following a vector field. Definition at line 52 of file VFMechanicalWorkOptimizationObjective.h. Definition at line 56 of file VFMechanicalWorkOptimizationObjective.h. Definition at line 63 of file VFMechanicalWorkOptimizationObjective.h. Compute mechanical work between two states. 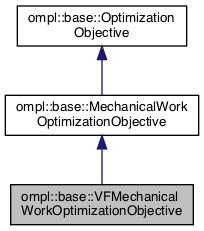 Definition at line 69 of file VFMechanicalWorkOptimizationObjective.h. Definition at line 92 of file VFMechanicalWorkOptimizationObjective.h.